A better than expected weekend in Torridon, given the poor forecast. After initial frustrations with an alarm from the water purifier, things went smoothly at the hut. We had lighting in one form or another and good cooking facilities. On saturday, the further west you were, the longer you stayed dry. Martin, Chris and Fiona M went climbing at Diabaig, as demonstrated below, doing routes 1 and 2 on the main cliff, the rain not hitting them until 4:30pm. Kate, Ian, Allan S and myself did Beinn Damh, walking in to coire Roill and up the north east ridge to the summit. The morning was wet, but the clouds cleared to give fantastic views for the walk back along the ridge. Sara and Pete had a long day climbing Maol Chean Dearg from the hut, while Anne met up with Richard H and his young Boxer to do Beinn Liath Mhor and Sgorr Ruadh. A couple of SMC types joined us late in the evening, gloating that they had been in Applecross where it had stayed dry all day! 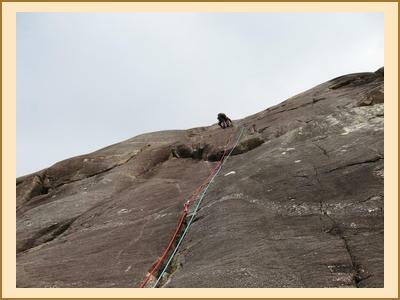 On sunday, everyone stayed dry apart from Sara and Pete's climbing in Dingwall being curtailed. Anne had the sunshine on Moruisg and Sgurr nan Ceannaichan, I did Meall a ' Ghiuthais from Kinlochewe. Kate, Allan and Ian traversed Beinn Dearg from west to east, starting at Torridon House and ending back at the car park opposite the hut. 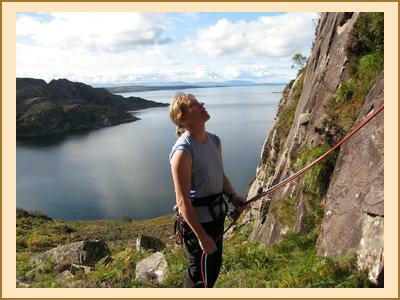 Martin, Fiona and Chris did some more interestingly titled routes on Sgurr a Chaorachain - Sword of Gideon and Bumbylone.